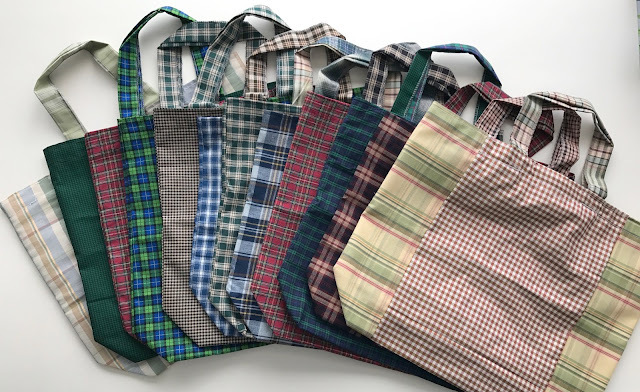 Green Bag Lady: Mad for Plaid FREEBIE! Lately, we have been inundated with plaid fabric here in Colorado. Did people decide they no longer like plaid and wanted to donate all of it? Hmmm. Doesn't matter, it makes great bags! 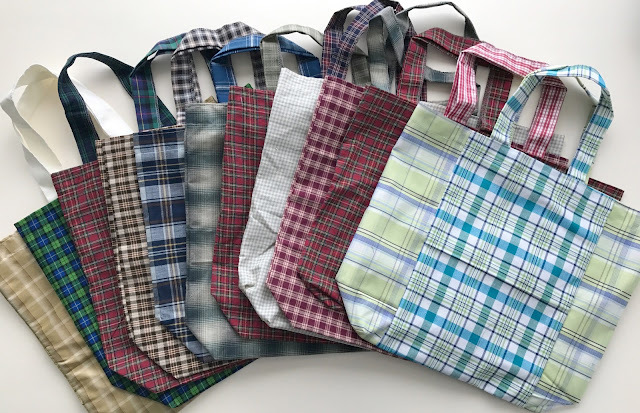 We have 23 great plaid bags up for grabs. Would you like one? •LEAVE A COMMENT, IN THE COMMENT LEAVE YOUR EMAIL ADDRESS IN THIS FORMAT: name(at)something(dot)com it is important to spell out DOT and AT so you don't get spam, if you DO NOT leave an email address, you will not be entered in the freebie. Don't forget to leave us your email! We will only contact you if you win. We will randomly pick 23 people to win plaid bags. One entry per person. If you enter more than once, all your entries will be disqualified. We will ship shopping bags internationally. You MUST use English for your comments. Do the best you can, use Google Translate if necessary. Non-English comments will be removed. New to Green Bag Lady? Click HERE. Like Green Bag Lady on Facebook HERE. To make your own bags, super easy pattern HERE. Check out my etsy shop that helps support Green Bag Lady HERE. wooohooo .. another giveaway, WTG you guys. Mad for Plaid here too! Love, love, love these bags!!! I like the Gray and black plaid. It looks cool. This Irish girl would love one. Wow, this will be very suitable for my hubby! really I want your bag. Нandbags charm ! Bags are very beautiful! I really want this bag! O! Super great plaid bags!Very practical!Teresa,thank you! Oh, that's very original fabric! Want a handbag. Long live the green bags from Theresa!!! Beautiful handbags!!!!! !I really want this!!! What beauty! I really want such a handbag made of the most delicate fabric with an original design! Thank you for taking care of nature! Thank you, Teresa for original ideas. Bags wonderful! Teresa, it's a great idea to produce such handbags. Thank you! Nice bags! I like it! I whant it!!! Hello! I am writting to you for the fifth time, but it is very difficulte to win this prize. I'd like to win one. Thank you very much for your bags! I love these delicious handbags! I would like to win! Wow! I love plaid fabrics. Especially red and green colors. Thanks for the giveaway! Have a nice day! If I win, I will give to my son as these are "manly" enough that he would use them, lol. I, too, am mad for plaid! Great bags! I really want to get this! Very beautiful and practical bag. Want one of those! Love these bags. I too am mad for plaid. Even my sons would feel comfortable using one of these bags in the grocery store . Thanks for the opportunity. We love plaid here in California :-) Thank you! No more entries will be considered. 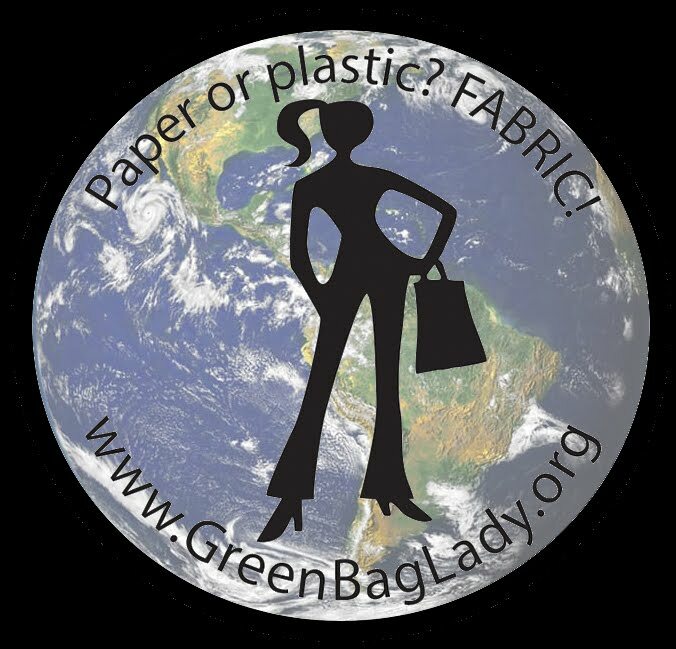 We give out bags at Green Bag Lady events and FREEBIE posts on this site! Check back often for further info! There is a pattern and DIY video to make your own bags! 57,700 FREE SHOPPING BAGS have been given away by Green Bag Lady! They are used daily in more than 3600 US cities, plus over 1700 cities in over 650 territories/ provinces/ countries world wide! Click image to see a video about the project. Happy Travels Wallet Tutorial on Sew Mama Sew! Knit Book Cover Tutorial on Sew Mama Sew! Quilted Lunch Tote Tutorial on Sew Mama Sew! VIDEO--A little about the bags. . .
57,700 Free Shopping Bags and counting! This project is dedicated to the memory of my mother, Margaret A. VanHatten. I think of her often while I sit at the sewing machine. She taught me to sew as a young girl and enjoyed making practical items. I miss her every day. I believe she would love this project. In fact, I think she would be helping me sew! Recycling 101 or maybe 102. . .
A few of my favorite posts. . .
We Are Nashville. . .500 bags! The Story of Stuff--Must See!! !